Governor of Pakistan's Largest Province Punjab Salman Taseer is shot dead by one of this own Security Guard on Tuesday evening in Capital Islamabad. Governor Salman Taseer was present in a Restaurant of Islamabad where he done meeting with a friend for 40 minutes and when he came out of Restaurant a Security Guard named Mumtaz Hussain Qadri attacked him and he was died on spot. 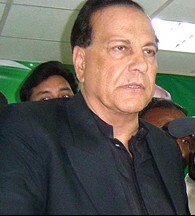 Salman Taseer was hit 26 fires due to which he died on the spot. Killer Mumtaz was arrested by other Security Guards present at the spot. Attacker has said that i attacked Governor for opposing the blasphemy laws. Salman Taseer was member of Pakistan People Party and a successful Businessman having Billions of Dollars. This murder is another addition in Killings of Famous Leaders that where killed by their own Bodyguards. India's Former Prime Minister Indra Gandhi was killed by her Sikh Bodyguards for doing operation on Sikh's Religious Place Golden Temple.